For Wikipedia's glossary, see Help:Glossary. A glossary, also known as a vocabulary or clavis, is an alphabetical list of terms in a particular domain of knowledge with the definitions for those terms. 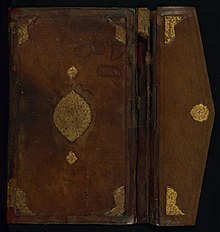 Traditionally, a glossary appears at the end of a book and includes terms within that book that are either newly introduced, uncommon, or specialized. While glossaries are most commonly associated with non-fiction books, in some cases, fiction novels may come with a glossary for unfamiliar terms. A bilingual glossary is a list of terms in one language defined in a second language or glossed by synonyms (or at least near-synonyms) in another language. In a general sense, a glossary contains explanations of concepts relevant to a certain field of study or action. In this sense, the term is related to the notion of ontology. Automatic methods have been also provided that transform a glossary into an ontology or a computational lexicon. 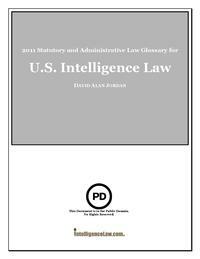 The Intelligence Law glossary provides a description of the key terms in intelligence law. A core glossary is a simple glossary or defining dictionary that enables definition of other concepts, especially for newcomers to a language or field of study. It contains a small working vocabulary and definitions for important or frequently encountered concepts, usually including idioms or metaphors useful in a culture. Computational approaches to the automated extraction of glossaries from corpora or the Web have been developed in the recent years. These methods typically start from domain terminology and extract one or more glosses for each term of interest. Glosses can then be analyzed to extract hypernyms of the defined term and other lexical and semantic relations. ^ R. Navigli, P. Velardi. From Glossaries to Ontologies: Extracting Semantic Structure from Textual Definitions, Ontology Learning and Population: Bridging the Gap between Text and Knowledge (P. Buitelaar and P. Cimiano, Eds. ), Series information for Frontiers in Artificial Intelligence and Applications, IOS Press, 2008, pp. 71-87. ^ R. Navigli. Using Cycles and Quasi-Cycles to Disambiguate Dictionary Glosses, Proc. of 12th Conference of the European Association for Computational Linguistics (EACL 2009), Athens, Greece, March 30-April 3rd, 2009, pp. 594-602. ^ J. Klavans and S. Muresan. Evaluation of the Definder System for Fully Automatic Glossary Construction. In Proc. of American Medical Informatics Association Symp., 2001, pp. 324–328. ^ A. Fujii, T. Ishikawa. Utilizing the World Wide Web as an Encyclopedia: Extracting Term Descriptions from Semi-Structured Texts. In Proc. 38th Ann. Meeting Assoc. for Computational Linguistics, 2000, pp. 488–495. ^ P. Velardi, R. Navigli, P. D'Amadio. Mining the Web to Create Specialized Glossaries, IEEE Intelligent Systems, 23(5), IEEE Press, 2008, pp. 18-25. Look up glossary in Wiktionary, the free dictionary. maxprograms.com: Introduction to GlossML This article presents Glossary Markup Language (GlossML), an open XML vocabulary specially designed to facilitate the exchange of glossaries. www.maxprograms.com: Anchovy Anchovy is a free multilingual cross-platform glossary editor and term extraction tool based on the open Glossary Markup Language (GlossML) format.